Manipal Hospital Whitefield announced the joining of Dr.Venugopal Subramaniam as Consultant in Neursurgery Department of the Hospital. Dr.Venugopal will be available for OPD Consultation on Tuesdays, Thursdays & Saturdays between 9.00am to 2.00pm. 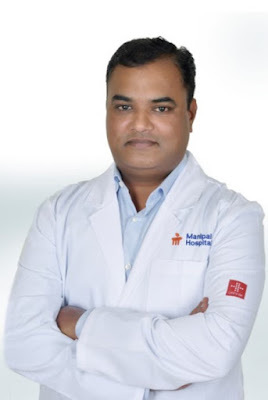 Having an experience of over a decade post qualification, Dr.Venugopal is having hands-on experience in various subspecialties of Neurosurgery, which includes complex Brain and Spine diseases in both adult and pediatrics. His special interests are in Neuro oncology, Deep brain stimulation(DBS), Epilepsy surgery, Spinal deformity and Minimal invasive spine surgery (MISS). With Functional Neurosurgery getting more importance in the area of today’s Neurosurgery, Dr. Venugopal’s academic contribution and interest in research work on Stem cell Transplant for Parkinson’s disease, Deep Brain Stimulation and 3D printing technology for spinal deformity surgeries is an added advantage which can aid patient’s seeking highest order of treatment in these respective disorders. As a pioneer in healthcare, Manipal Hospitals is among the largest hospital network in India serving over 2 million patients annually .Its focus is to develop an affordable tertiary care multispecialty healthcare framework through its entire multispecialty delivery spectrum and further extend it to homecare. With its flagship quaternary care facility located in Bangalore, India, 7 tertiary care, 5 secondary care and 2 primary care clinics spread across India and abroad, today Manipal Hospitals successfully operates and manages 5,900 beds across 15 hospitals. Manipal Hospitals provides comprehensive curative and preventive care for a multitude of patients from across the globe. Manipal Hospitals has one-day care clinic in Lagos, Nigeria. Manipal Hospitals is first in India to be awarded accreditation by the AAHRPP for ethical standards in clinical research activities. It is also NABL, NABH and ISO certified. Manipal Hospitals is also the most respected hospital company in India and the most patient recommended hospital in India by consumer survey.